Big Blue Bug Solutions, formerly known as New England Pest Control, has been proudly serving Lincoln with the most comprehensive residential and commercial pest control services since 1935. Big Blue Bug takes great pride is supplying the highest quality pest control services in Lincoln, effectively getting rid of mice, termites, spiders and the always troublesome carpenter ants. 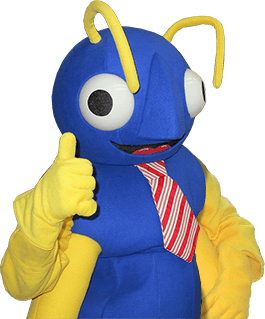 Big Blue Bug Solutions is easily recognized by our iconic 4,000 pound steel termite, Nibbles Woodaway, who makes his home on the top of the roof and can be seen easily from I-95. Whether it's insects or rodents that are causing you problems, our Lincoln exterminators are sure to resolve even your toughest pest problems. While small black ants in your home are merely a nuisance, carpenter ants can cause extensive damage to your home’s structure. These large ants can measure up to ½ an inch in length and are generally black, red or a combination of both. Unlike termites, carpenter ants do not eat wood, but just chew holes for tunnels and galleries for their large colonies. Typical signs that you have carpenter ants in your home are small piles of sawdust near woodwork and tiny holes in walls, beams, windows and door frames. If even after you have implemented all the carpenter ant prevention tips you are still finding them parading around or inside your home, contact Big Blue Bug Solutions and let us get rid of carpenter ants at your Lincoln home or business today! At first sighting of carpenter ants you should contact a professional at once. Big Blue Bug Solutions’ exterminators are experienced and trained on detection, extermination of entire carpenter ants colonies and application of treatments to prevent future infestations. Our carpenter ant control in Lincoln is customizable, making sure we effectively get rid of all carpenter ants and include a one year carpenter ant warranty that can be renewed on a yearly basis and be transferred to new owners should the home be sold. If you have noticed carpenter ants in your home, do not attempt DIY products or procedures, for they can make the infestations even worse. Contact our Lincoln office and schedule an appointment today!